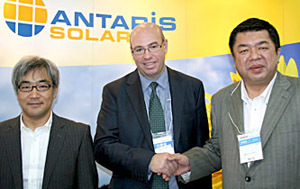 Slough, UK / Tokyo, Japan – 15th February 2013 – ANTARIS SOLAR, a German provider of photovoltaic technology, has opened an office in Tokyo to make its high performance module series and PV products available throughout Japan. A Megawatt deal has already been signed with Clean Energy Japan, a company located in the Fukushima area. Shortly after the official launch of its Tokyo office, ANTARIS SOLAR concluded a contract with Clean Energy Japan, a company located in the Fukushima area, who ordered a Megawatt of 230 Watt polycrystalline modules. First contact with Clean Energy had been established at the PV Japan trade fair 2012 in December, where ANTARIS SOLAR was preparing the Japanese office launch.